Containment or Drywell Building - a building designed to sustain pressures of about 50 pounds per square inch. Normally houses the reactor and the related cooling system that contains highly radioactive fluids. Building is of steel construction. Sometimes the building is surrounded by a concrete structure that is designed for much lower pressures (3 pounds per square inch). The area between the steel and concrete building is called the annulus. Designs vary. At one facility there are 4 1/2 foot thick concrete walls reinforced with steel. The dome is 2 1/2 feet thick and the base 12 feet thick. The containment is the 3rd fission product barrier. In BWRs, the drywell is located in the reactor building. Auxiliary or Reactor Building ( a building separate from the containment that houses much of the support equipment that may contain radioactive liquids and gases. Emergency equipment is also normally located in this building. The turbine hall of Bruce Power's Bruce A nuclear power plant in Ontario, Canada. Turbine Building - a building that houses the turbine, generator, condenser, condensate and feedwater systems. Diesel Generator Building - a building used to house the diesel generators and supporting systems (air, water, radiator fans, fuel oil, lubricating oil, air conditioning, and ventilation). In some cases, related electrical switchgear for distributing electrical power produced by the diesel generator. The Diesel generators that provide backup electrical power to safety and non-safety systems. Cooling tower pumps used to pump water to cooling towers. Cooling towers are often used for power plants located on rivers and small lakes so that impact of temperature of discharged water on fish is minimized. 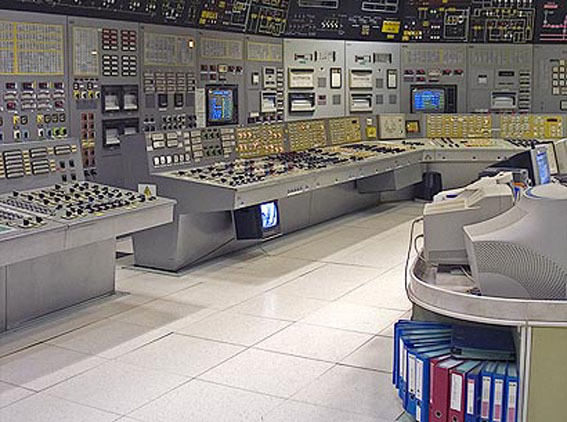 Control room at Slovenské elektrárne's Bohunice nuclear power plant in Slovakia. The boiling water reactor operates in essentially the same way as a fossil fuel generating plant. Neither of these types of power plants have a steam generator. Instead, water in the BWR boils inside the pressure vessel and the steam water mixture is produced when very pure water (reactor coolant) moves upward through the core absorbing heat. The water boils and produces steam. When the steam rises to the top of the pressure vessel, water droplets are removed, the steam is sent to the turbine generator to turn the turbine.A BWR has many similarities to a PWR but there is only one circuit with water at lower pressure so that it boils in the core at about 285°C. The water in the top part of the core is in the form of steam, which has a lower moderating effect. The steam passes directly to the turbines, which are thus part of the reactor circuit. Also, the control rods enter from below. 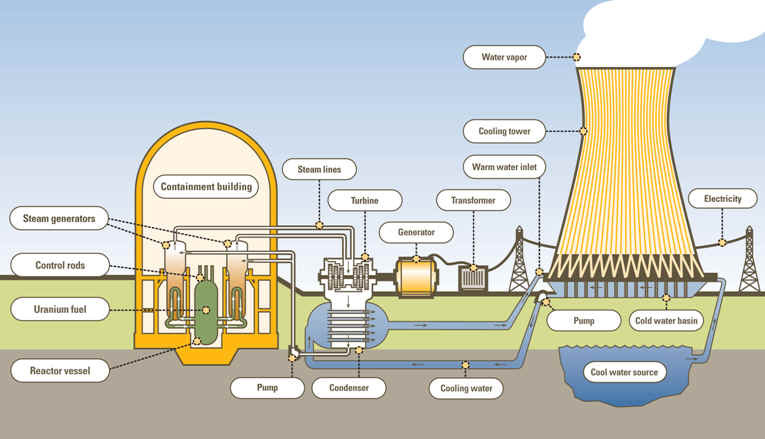 The pressurized water reactor differs from the BWR in that the steam to run the turbine is produced in a steam generator. Water boils at 212°F or 100°C. If a lid is tightly placed over a pot of boiling water (a pressure cooker), the pressure inside the pot will increase because the steam cannot escape. As the pressure increases, so does the temperature of the water in the pot. In the PWR plant, a pressurizer unit keeps the water that is flowing through the reactor vessel under very high pressure to prevent it from boiling. The hot water then flows into the steam generator where it is converted to steam. The steam passes through the turbine which produces electricity. 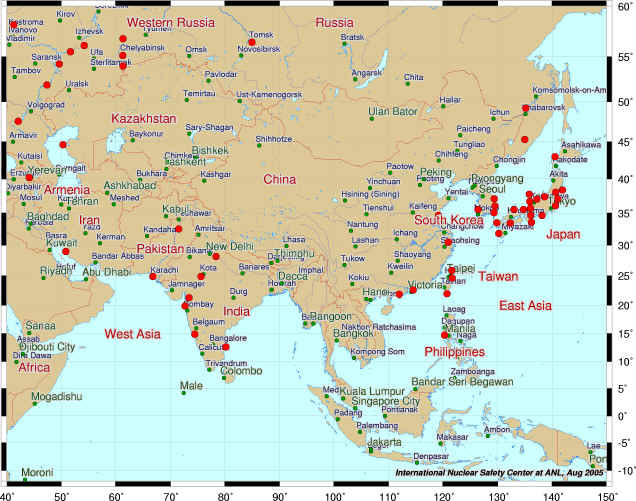 About 60% of the world’s commercial power reactors are Pressurized Water Reactors (PWRs). The core typically consists of about 200 fuel assemblies each containing a similar number of fuel rods. A fuel assembly contains 24 guide tubes in which control rods can slide in and out of the core. Each fuel rod comprises a stack of pellets of enriched uranium oxide (UO2) cladded in a sealed tube of Zircalloy (slightly alloyed zirconium). The oxide is a ceramic that melts at about 2800°C. Water is able to flow freely between the fuel rods, while being directed through the fuel assembly in a prescribed fashion. The control rods containing neutron-absorbing material such as boron or cadmium are used to fine-tune the reactor operation and shut down the reactor in normal operation or in the event of a malfunction. Secondary shutdown systems involve adding other neutron absorbers such as boric acid, usually as a fluid, to the system. In PWRs, ordinary water is used both as a moderator and as a coolant. This is a closed loop heat exchanger circuit carrying light (ordinary) water at very high pressure so that it does not boil even at about 300°C. 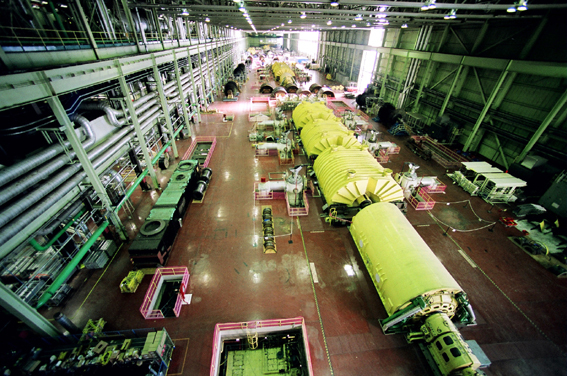 The steam generators are towers containing very long narrow pipes through which water from the nuclear core is pumped, transferring heat to a secondary coolant circuit. Here, water at a lower pressure runs through the heat exchangers and boils to produce steam. This steam is then sent to drive a turbine producing electricity through a generator system. The condensed steam or water is returned to the heat exchanger. High melting temperature ceramic pellets themselves, as fission products are trapped in small pores. Zircalloy cladding that is corrosion resistance with low neutron absorption. A small space at the top of the fuel rod accommodates any fission gas that escapes from the pellets. 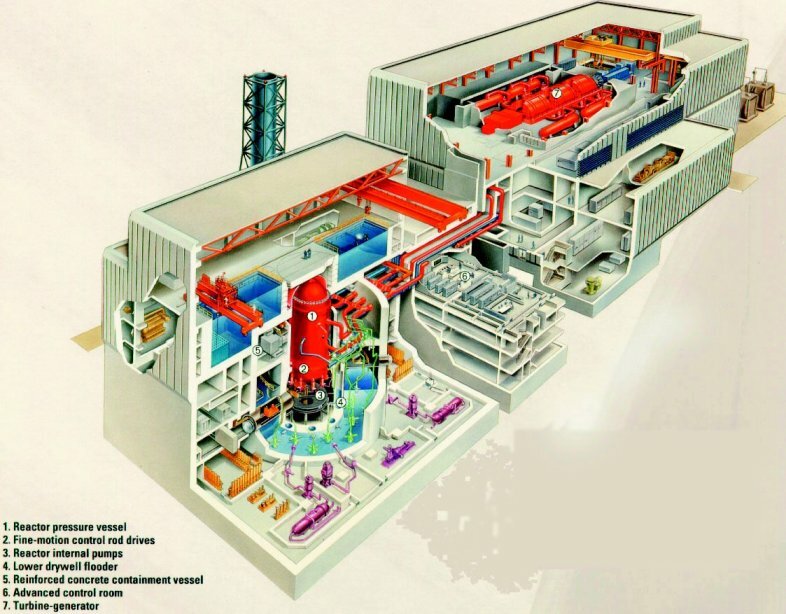 CANDU is a pressurized heavy water reactor operated on natural uranium fuel (U-238) and uses heavy water (D2O) as coolant and moderator. 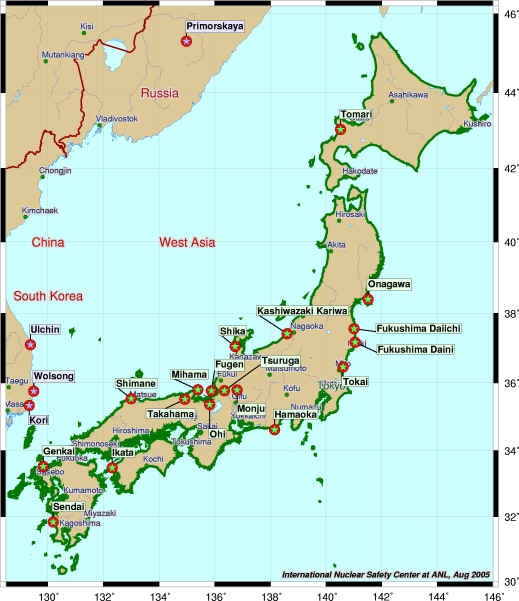 CANDU is an acronym for CANada Deuterium Uranium. The CANDU reactor is capable of on-line refuelling during operation. RBMK is a type of pressure tube reactor designed in the former Soviet Union, which uses ordinary boiling water as the coolant and graphite as the moderator. This type of reactor is capable of on-line refuelling. The reactor involved in the Chernobyl accident belongs to this type. The advanced gas cooled reactor (AGR) is similar to Gas Cooled Reactor with the exception that the uranium is enriched. These use natural uranium metal fuel which is clad in a special magnesium alloy that absorbs very few neutrons, which is essential to achieving criticality with non-enriched fuel (or natural uranium). The specially developed magnesium alloy resists corrosion (no oxidation), hence the name MAGNOX. The volume of the core is huge (about 40 times that of a PWR), due to the large distances needed to slow down the neutrons to thermal energies. The fuel sits in individual channels through the moderator. Large blowers drive the carbon dioxide coolant from bottom to top and then into the heat exchangers to raise steam as in PWRs. The control rods enter into holes in the moderator from above. Although the large size of the core makes the capital cost higher, it has the advantage that any fault involving the abnormal heating of the core proceeds very slowly. Also, single-phase (gas) coolant is intrinsically safer as it is devoid of void effects. where e = efficiency, T = temperature, and maximum and minimum temperatures are in Kelvin. Operating reactors at high temperatures (about 950°C) would permit not only higher efficiency, but could also lead to wider direct applications such as hydrogen production, which is more efficient at higher temperatures. However, such high temperatures require the resolution of many technical problems. Problems with maintaining water in a dense state, and steam and carbon dioxide reacting with graphite lead to the choice of helium as the coolant. Fuel is in the form of particles (less than a millimeter in diameter). Each has a kernel of uranium oxy-carbide, with the uranium enriched up to 9% U-235, surrounded by layers of carbon and silicon carbide, giving a containment for fission products which is stable up to 2000°C. Fuel elements are arranged with vertical coolant passages in the graphite moderator. The cylindrical core containing the fuel elements is surrounded by a moderating graphite reflector. 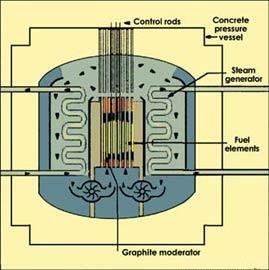 The control rods are located vertically in the circumferential wall. Helium gas is heated by passing it over the fuel in the core, which in more advanced designs drives a gas turbine in a direct cycle to produce electricity. The direct cycle dictates that a high integrity of fuel and reactor components is ensured. Small test HTRs have been operating for many years in Germany, the UK and elsewhere. 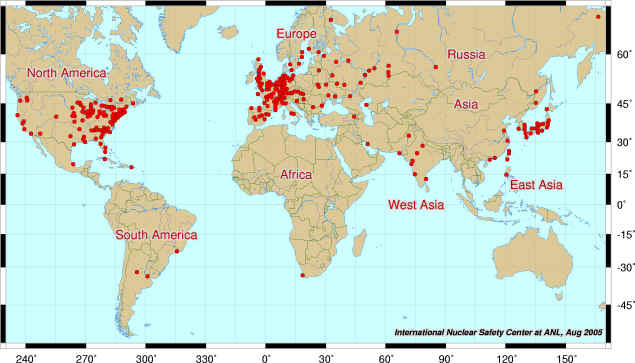 However, recent technological developments have made these reactors more practical than in the past, and more advanced designs are now being considered in South Africa, China, Japan and the EU. The fast breeder reactor (FBR) uses a plutonium fuel rather than uranium. The Pu is surrounded rods of U-238 which absorb neutrons and are transmutated into Pu-239. As the plutonium in the core becomes depleted it creates or breeds more plutonium from the uranium around it. 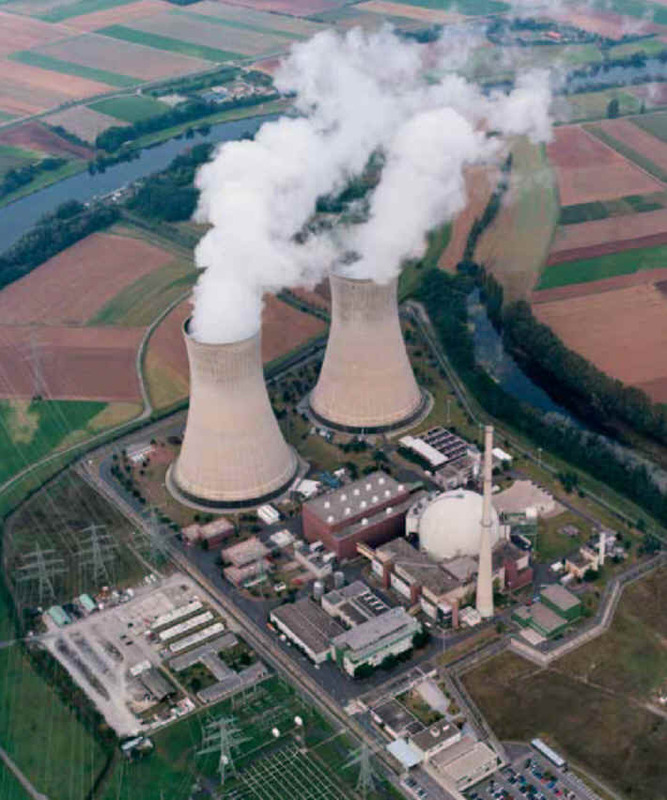 Because of the extreme temperatures surrounding the reactor a special coolant of liquid sodium (Na) is used to transfer heat to the steam generator. The role of the steam generator is as usual. The lack of a moderator to slow neutrons gives the word fast to the name. There are 65 Nuclear Power Plants in The United States that have 104 commercial nuclear generating units that are fully licensed by the U.S. Nuclear Regulatory Commission (NRC). 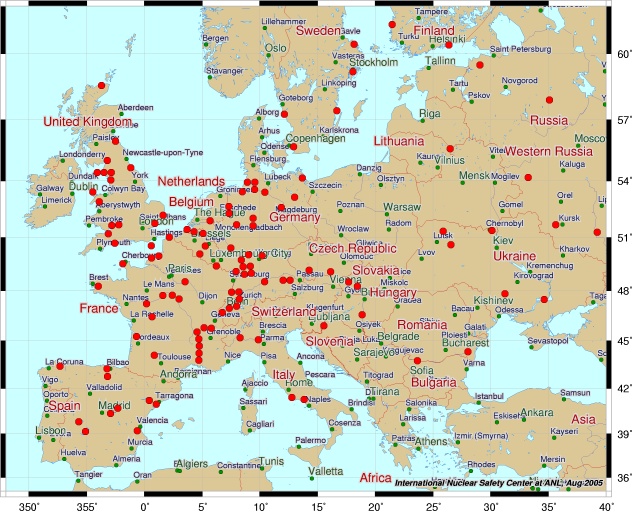 Of these 104 reactors, 69 are categorized a pressurized water reactors (PWRs) totaling 65,100 net megawatts (electric) and 35 units are boiling water reactors (BWR) totaling 32,300 net megawatts (electric). 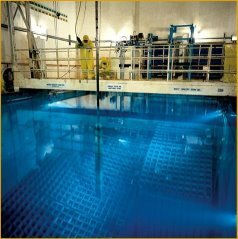 Although the United States has the most nuclear capacity of any nation, no new commercial reactor has come on line since May 1996. The current Administration has been supportive of nuclear expansion, emphasizing its importance in maintaining a diverse energy supply. 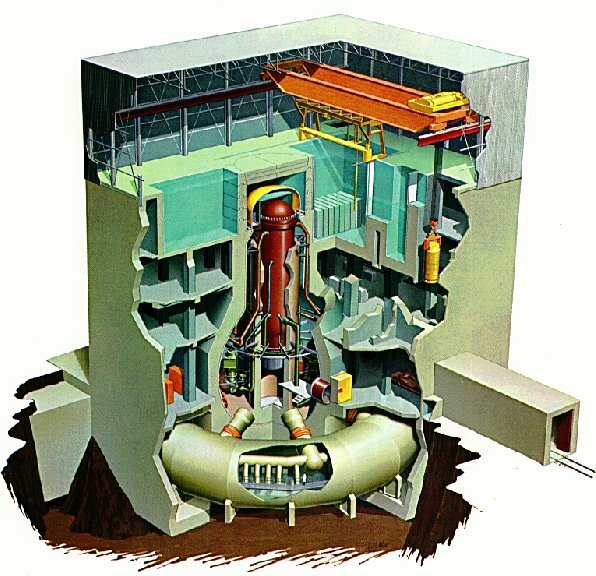 The last reactor to come on line in the United States was the Watt’s Bar reactor in Tennessee, owned and operated by the Tennessee Valley Authority. 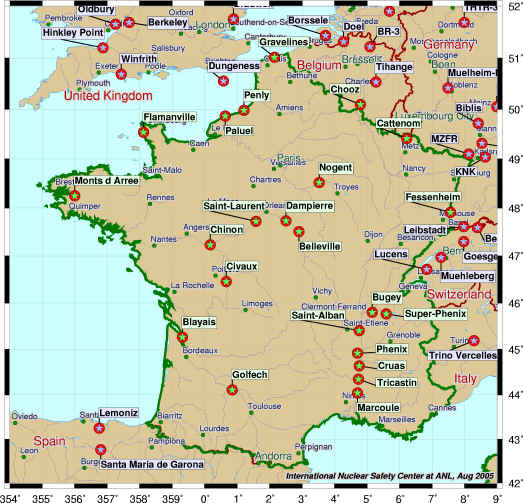 It began commercial service in May 1996. Nevertheless, US commercial nuclear capacity has increased in recent years through a combination of license extensions and uprating (upgrading) of existing reactors.